You gotta crawl out of the kitchen cave from time to time and explore the culinary delights of the big city. 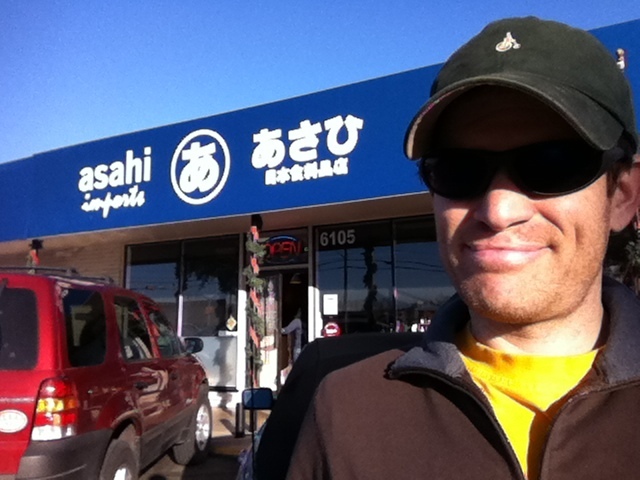 On a morning jog, I ran past Asahi imports on Burnet Road and scoped it out later that day. My first impression was that the store was chock full of quickie noodle meals and Asian snacky packages. Upon more detailed inspection, I noticed a few interesting items such as 100% buckwheat soba, and many unfamiliar spices. 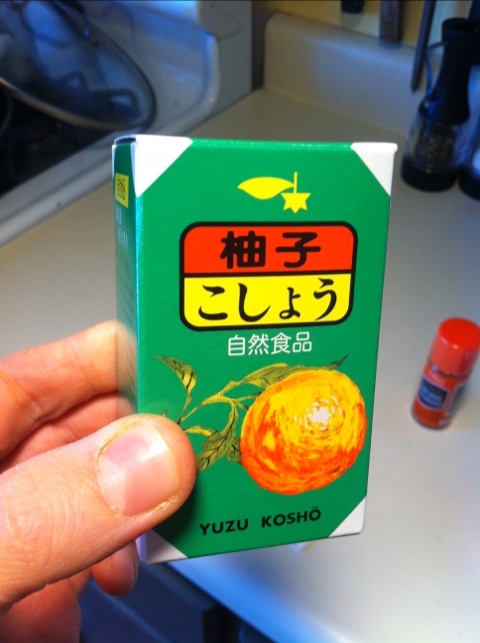 The first thing that grabbed my attention was this yuzu paste. 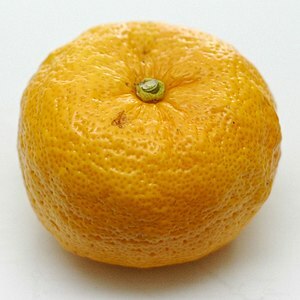 Yuzu is a citrus fruit that is used to outstanding effect at Uchi and other upscale establishments. This paste left me wanting more, however. I found the flavor to be very monotone and overly heavy on the green chili, with very little citrus aroma. 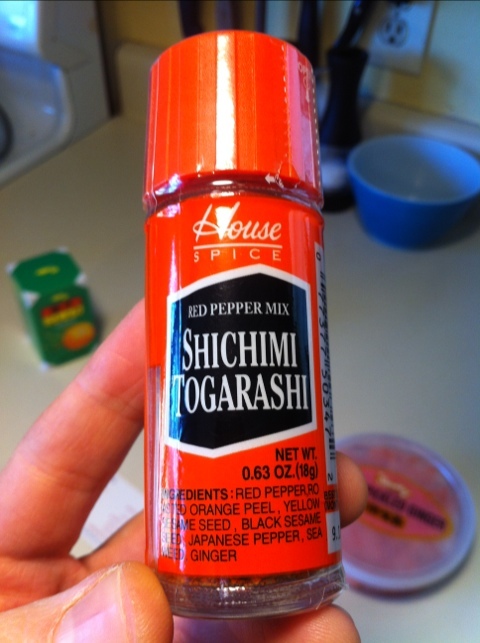 This spice, shichimi togarashi, lured me in with an intriguing blend of roasted orange, red pepper, ginger, and sesame, etc. I’m honestly still trying to put my finger on this, but it’s not nearly as flavorful as I hoped. Perhaps the cold I’m recovering from is still stunting my sense of taste. If anyone is familiar with this seasoning and its proper use, please drop a note! I’m thinking if I grind it in a mortar and add a bit o’ salt, that might help the flavor pop a bit more. Perhaps toast it in a dry saute pan. 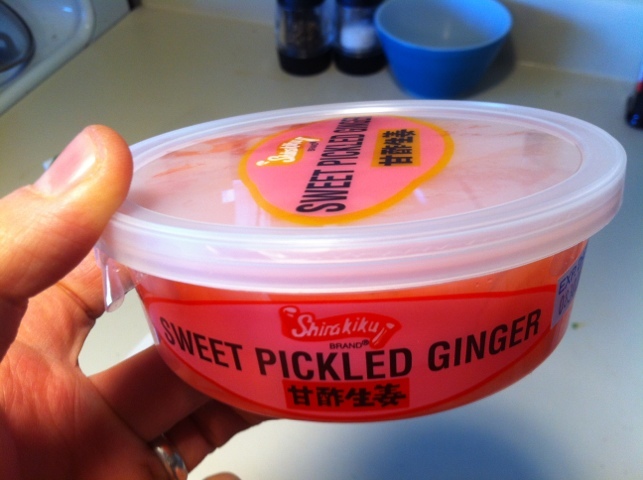 Lastly, I decided to stock up on pickled ginger. Not excited about the artificial coloring going on here, but I compromised. Lastly, I was behind a guy checking out with about 15 pounds of dried soybeans saying he was going to make tofu. I was impressed and let him know how cool that sounded. He responded by handing me his card, paying his tab, and leaving summarily. 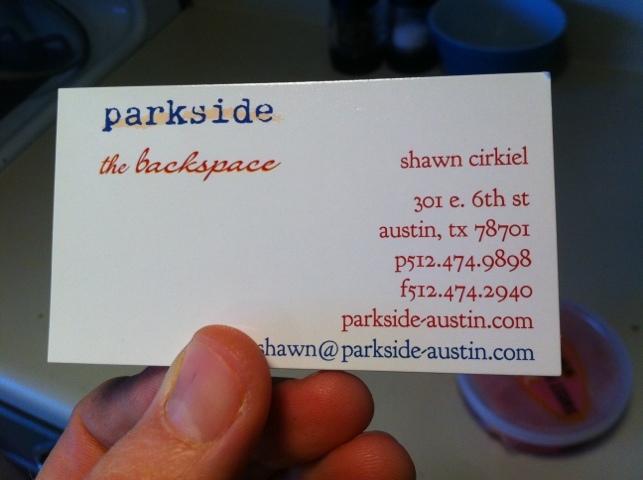 Before I could introduce myself, he was gone, but I realized that he was Shawn Cirkiel, the Culinary Institute of America-trained executive chef of Parkside, a noted restaurant here in Austin. Perhaps he’ll give me an externship later this summer since we’re such good buddies now – ha! Just watched “Local”, a short documentary film made in Austin, TX, about local food. I really enjoyed the discussion of the topics of local vs. organic food, the degradation of the food industry, and the importance of connecting with the source of your food. The film profiles a handful of restaurants/chefs who use local ingredients, as well. It featured local farms like Springdale Farms and Richardson Farms, which I wrote about in a previous post. The documentary is about 30 minutes long and recommended! LOCAL – A Short Documentary from Christian Remde on Vimeo. Kimbap is a Korean staple food consisting of steamed rice rolled up in a nori wrapper (dried seaweed), usually along with vegetables and/or some kind of protein. I learned about it during my travels to Korea several years ago, but only recently did I try to make it. Of course, it resembles what many of us refer to as sushi rolls, and they are very similar. My understanding is that traditional Japanese sushi involves dressing the rice with vinegar before rolling it, but kimbap does not have this characteristic. 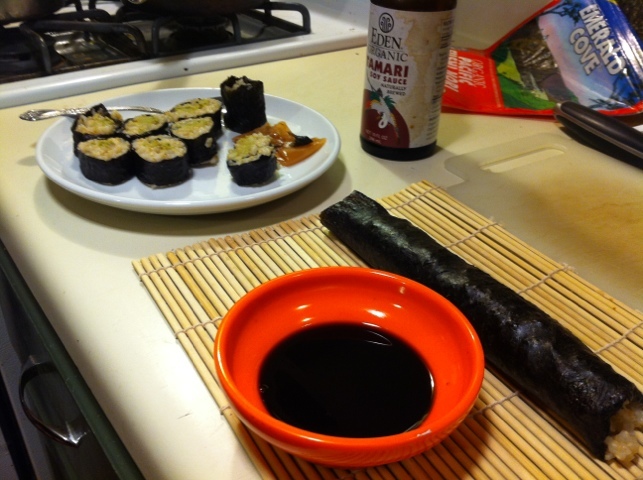 Below: A completed plate of kimbap, with a roll ready to be sliced lying on a bamboo mat. 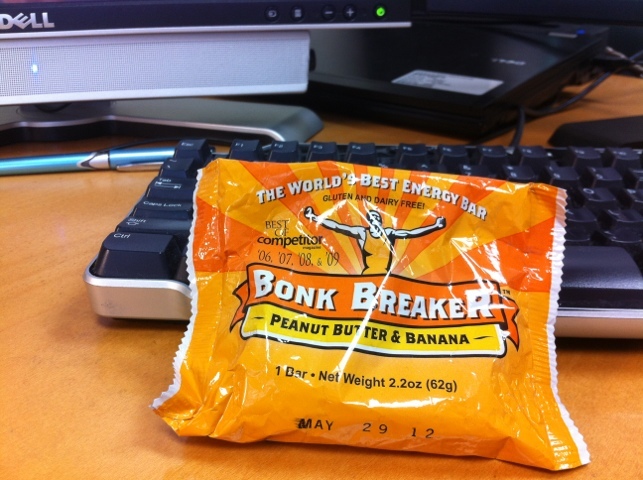 A friend of mine, runner and cyclocrosser extraordinaire Rolando Roman, gave me a couple of Bonk Breaker bars to try. Since I am always on the lookout for great tasting, nutritious, and gluten free snacks, I was happy to do a taste test. I tried the apple pie flavor and the peanut butter and banana flavor, and both were amazing. Bonk Breaker uses a lot fewer ingredients than typical energy bars and contains fewer and less processed ingredients than typical energy bars. They also taste LOTS better – the apple pie bar tasted just like a fresh apple pie, and the peanut butter and banana bar was like eating a fresh banana with PB spread all over it (one of my favorite treats). I didn’t think packaged energy bars could be so flavorful, but it tasted as if the bar was made and packaged 10 minutes before I opened it. Bonk Breaker looks and tastes like a delicious and gluten-free way to give yourself a hit of necessary carbs, fats, and proteins before or after a workout. Apple cider vinegar is very useful in salad dressings and has been used as a folk remedy for a number of ailments, so I found it intriguing to see that it’s being marketed as a grab-and-go beverage. According to WebMD, apple cider vinegar has shown some promise in promoting wellness in a variety of ways: blood sugar management, cholesterol lowering, weight control, and cancer treatment. 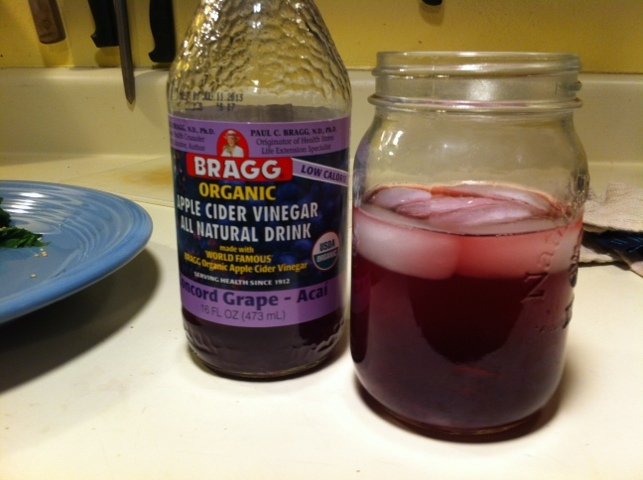 WebMD also cited a study which indicated that vinegar is associated with increased bladder cancer risk and reminds readers that none of these studies are conclusive enough to warrant encouragement to consume vinegar to gain any health benefits. Miracle cure or not, the apple cider vinegar is certainly costlier than water, and contains a bit of sugar, although not much. I’ll enjoy some of it as an occasional, possibly health-fostering, treat. I realized that (1) I didn’t show the process for creating the Romesco sauce from my chickpea fritters post and (2) I needed more Romesco sauce to complement the second batch of fritters. 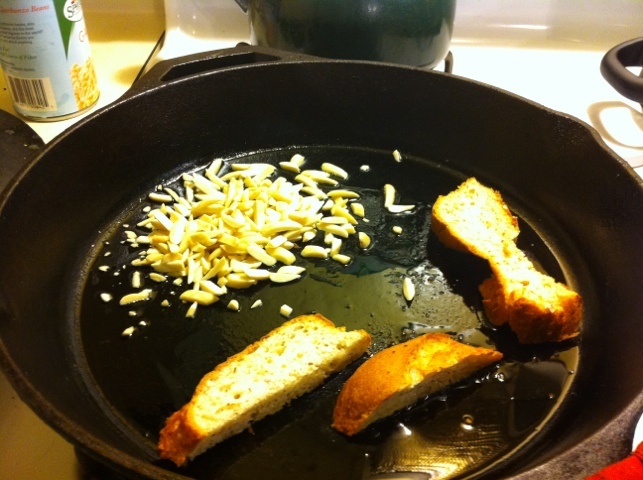 Below: Toasted some gluten-free bread (cook’s choice) and some slivered almonds. 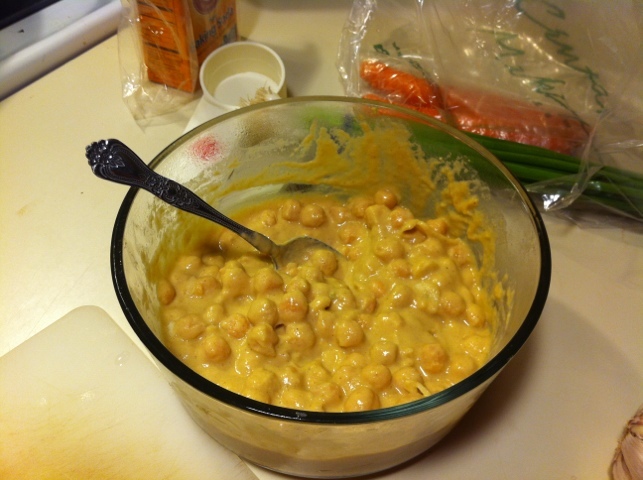 Nuts, such as almonds, are terrific for creating a creamy texture in any sauce when they are ground in a food processor. Using my cast iron skillet, and gaining some dietary iron in the process! 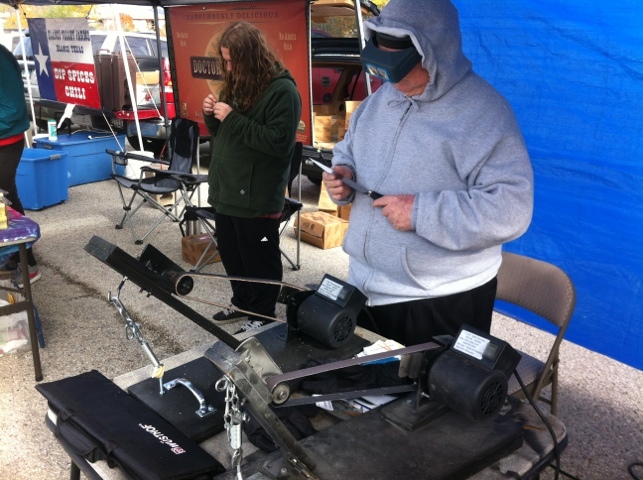 I went to the Barton Square farmer’s market to follow up on what seems like a fabulous deal – $3 for a professional knife sharpening. 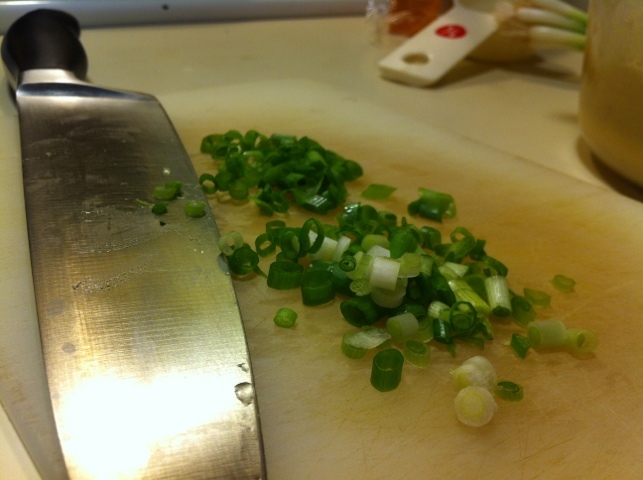 I brought my 8″ chef’s knife down for a fresh edge. 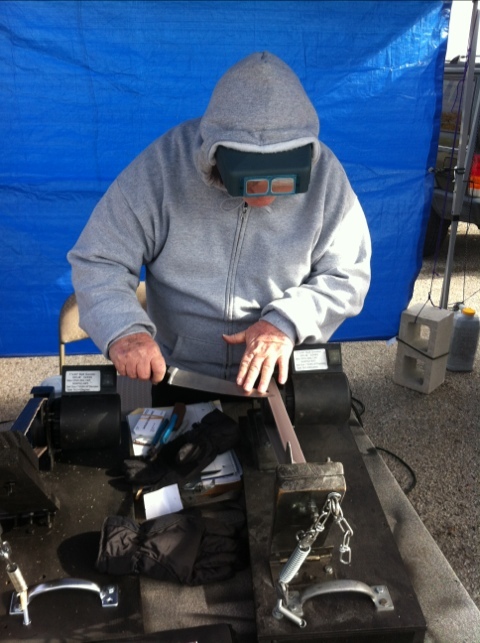 The sharpening begins with a fine grit sanding using a high speed belt (shown in the photo below, the belt on the right). It finishes with a sanding with an ultra fine grit on the left-side machine. I could not feel any level of grit when I touched the soft leather belt on the left, but it has something like a 4000 grit-clay combination on it. 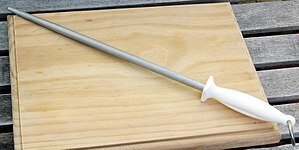 I used to think that a sharpening steel, such as the one pictured below, was the way to sharpen a knife. A sharpening steel, however, is only used to hone the blade, which means that the tiny curvatures and burrs that develop in the edge over several uses are merely straightened out. Still working my way through recipes in Big Vegan. 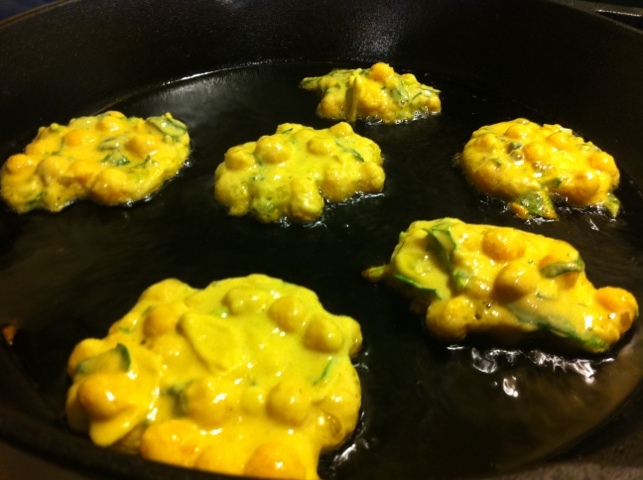 This time, I took on the chickpea fritters and the Romesco sauce. 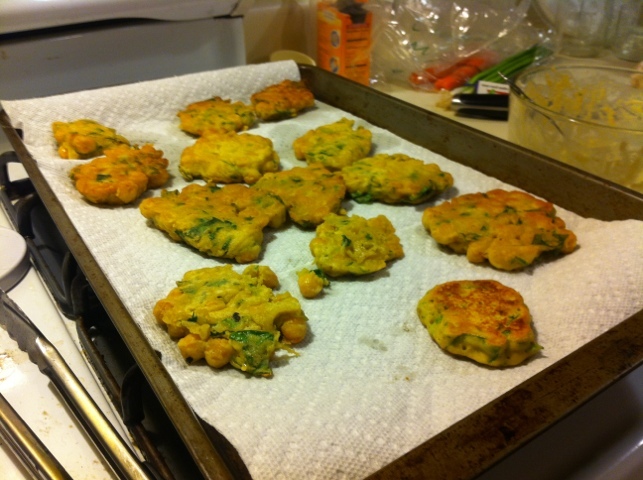 The fritters, being fried, may not be the healthiest item in the book, but for a party, they make great finger food. 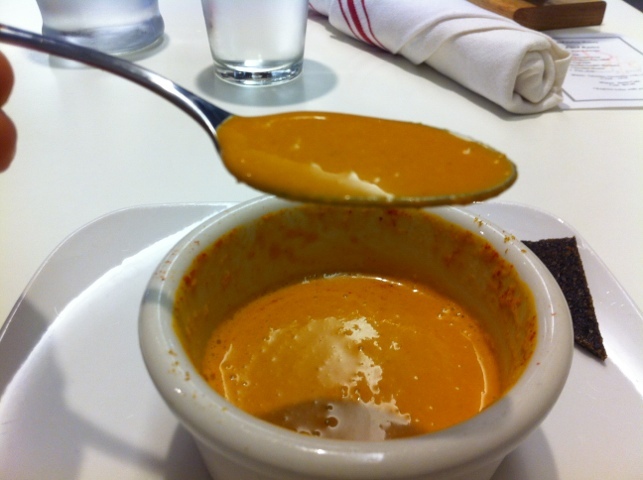 And the Romesco sauce pairs beautifully with them, for a rich roasted red pepper flavor. 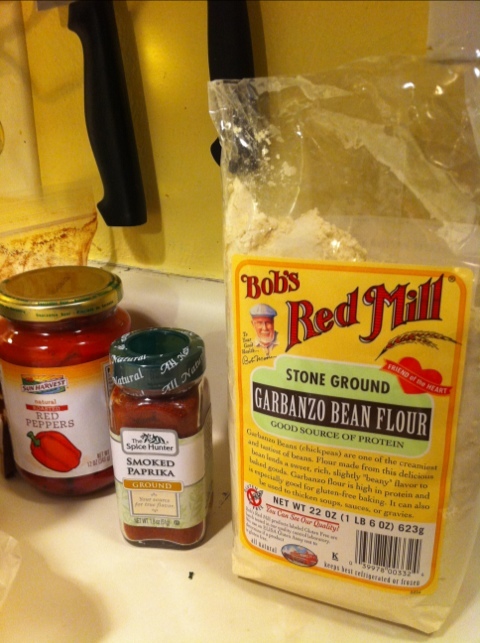 Below: This recipe did not call for smoked paprika, but regular paprika was used. The smoked paprika was in another dish I was making, and it was a spice I plan to use more of in the future! 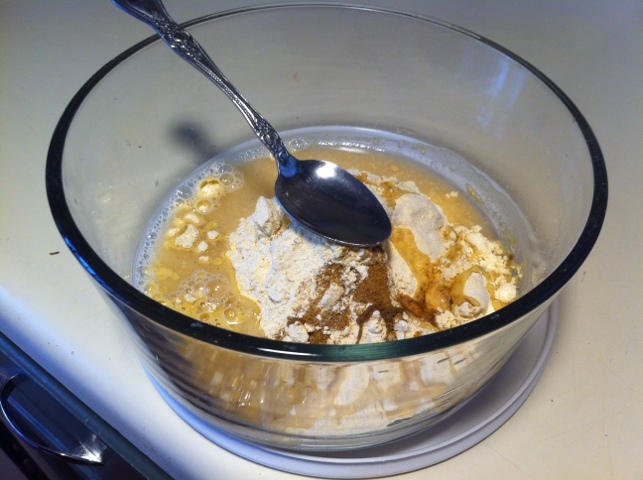 Below: Beginning to make the paste of garbanzo flour, cumin, salt, and water. 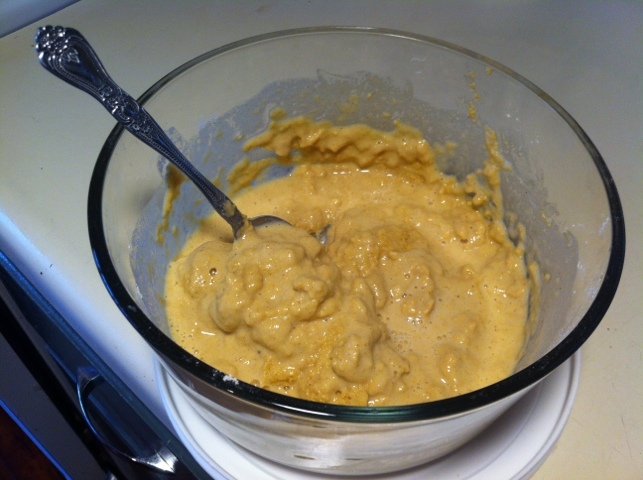 The mixture had to sit in the fridge for one hour so the flour could soak up the water. 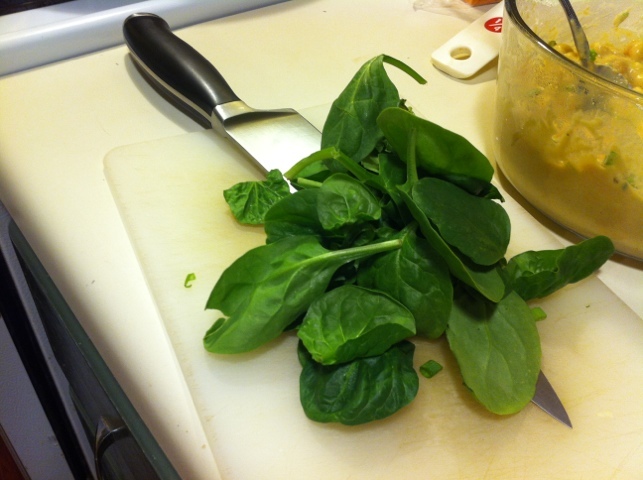 Below: Garlic, green onions, and spinach went in to add flavor and color to the fritters. 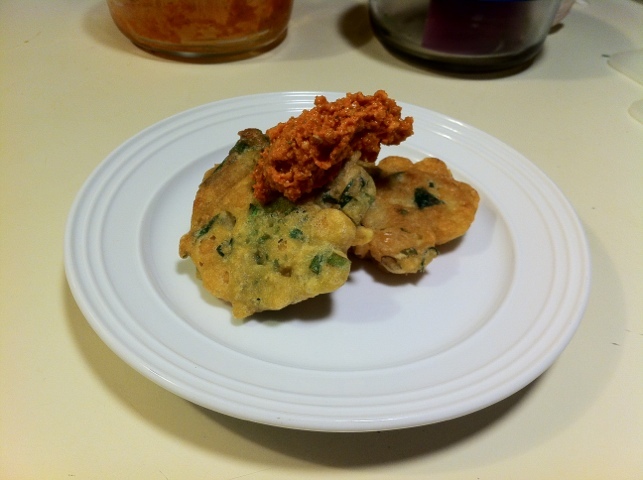 Below: Fritters with the Romesco sauce. Delicious! Slow Food Austin hosted a class on masa at The Natural Epicurean recently. I showed up to learn about masa and to whet my appetite by spending time in the kitchen where I’ll soon be spending my days. 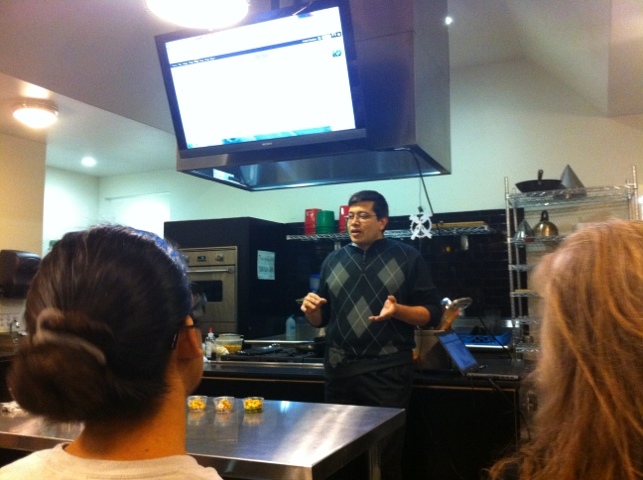 Below: Hector Gonzalez in the teaching kitchen of The Natural Epicurean. 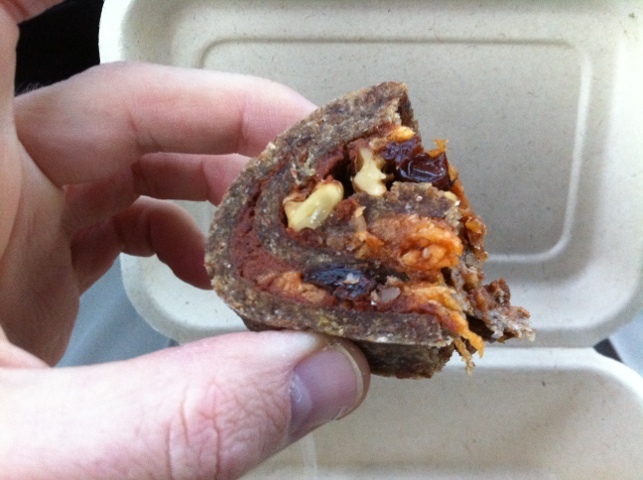 I hadn’t visited Beets, Austin’s premier raw food restaurant, since it opened a few years ago, so I decided to stop by a few times and try a few of their menu items. 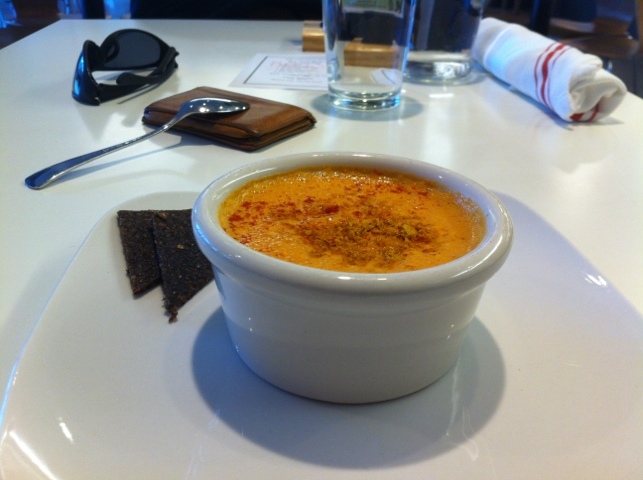 I scanned Yelp and consulted a friend for tips, and I wasn’t disappointed. Eating raw is a great way to eat nutritiously. This is because whole, unprocessed foods have the most nutrients. Processing of foods, which often includes harsh cooking techniques, results in overly refined foods from which the best nutrients have been stripped. Cooking also removes the water from food, so you end up eating way more calories because you don’t have the water content of the food to help fill you up. You don’t have to go 100% raw to get these benefits. Just increase the amount of raw plant-based foods you eat each day. Below: The carrot soup is my favorite thing on the menu. It hits you with carrot, subtle orange flavor, and ginger. The soup is very opaque without being very thick, which are things I love about it. Sweet and complex, it’s a must have on any visit. Below: One thing that’s striking about Beets is how perfectly clean and bright it is. It’s a perfect complement to the restaurant’s mission and reminder of the health benefits that come from eating the natural and living foods on Beets’ menu. 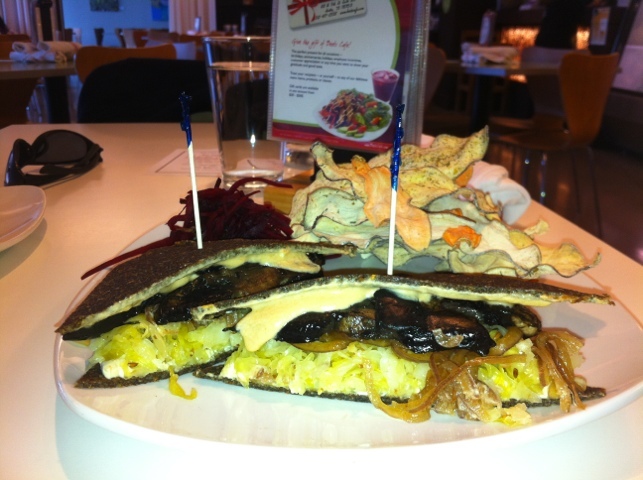 Below: The marinated mushroom and sauerkraut Reuben. They use a wonderful, chilled seed dressing. 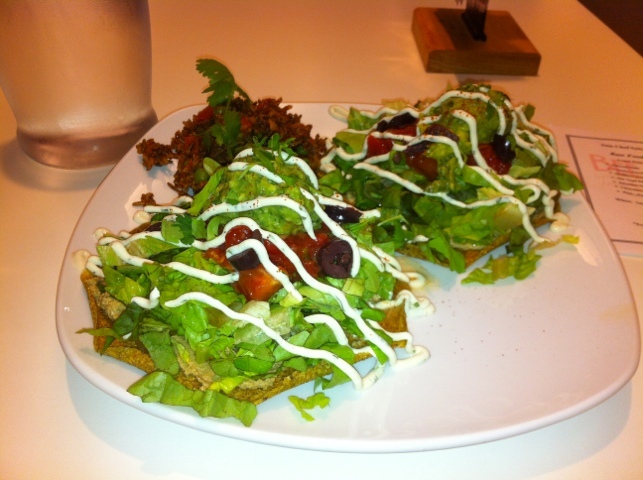 Below: The raw chalupas (yes, saying something is “raw” at Beets is duplicative, but come on – RAW chalupas!). The guacamole was cool and flavorful and the white sour “cream” drizzled on top was very close in flavor to the real thing, including the signature tang of sour cream. Below: Raw cinnamon roll. Yum! 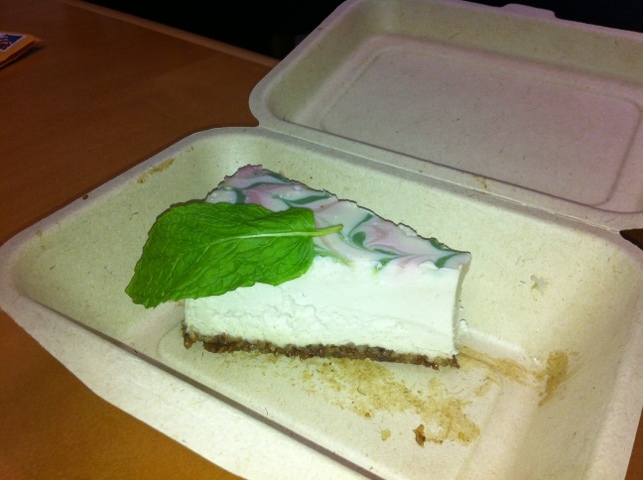 Below: Raw, nut butter based “cheesecake.” Peppermint cheesecake at that. Wow! A holiday treat with bright peppermint, creamy and true-to-form cheesecake flavor, and a nice crust. 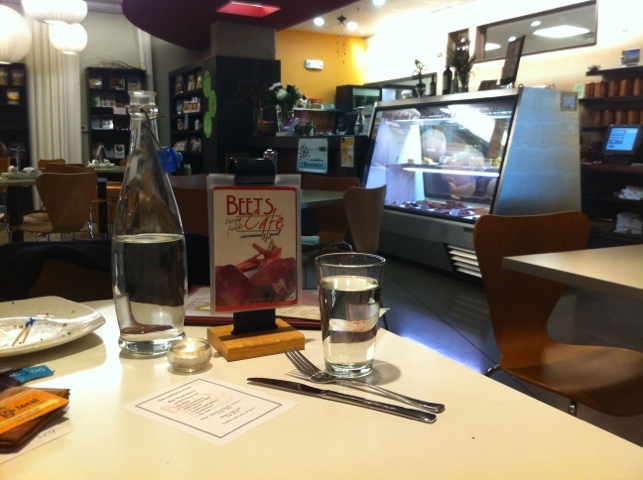 Beets is not a cheap place to dine, nor is it expensive. Considering the quality of the food, the care with which it’s prepared, and the nutritious benefits you get from eating it compared to the processed gruel you get in other establishments, you are getting more than a fair deal. Hopefully, Beets can inspire you to eat more raw plant-based foods at home and improve your health and well being for a lifetime.